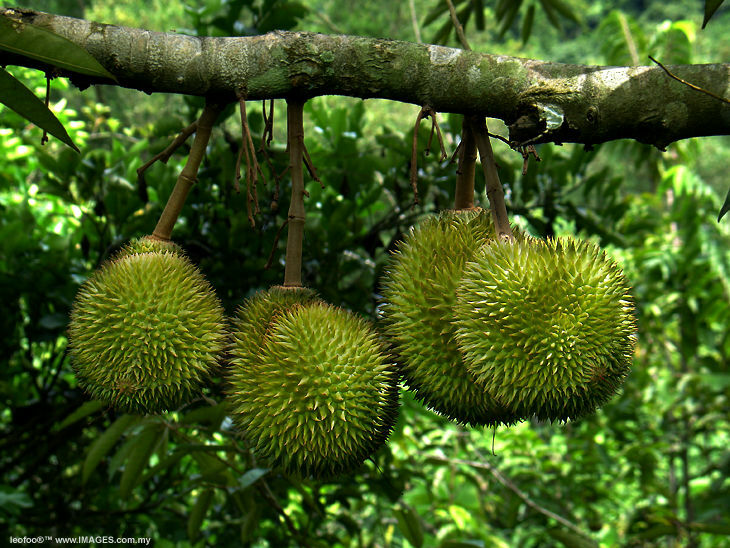 Curves and a Camera: Durian: Bad fruit or Bad rap? There's an amazing Asian Super Center near where I live - Fubonn. I'd hear so many fantastical things about it I had to go. I wasn't prepared for what I would find. 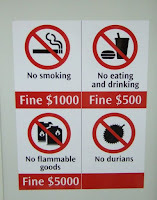 A lawyers and tax office, special occasion clothing stores, pots, pans, spoons, fans, incense, teas, bakery, onion buns, salapao, candies, noodle houses, and finally....DURIAN. 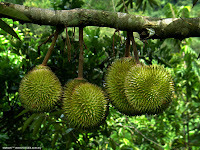 Now I had never seen a durian up close before. I've seen them on television - Andrew Zimmern spitting them out, saying they tasted like spoiled onions; Anthony Bourdain loving every bite and not understanding the bad reputation the fruit has. I consider myself a [fairly] adventurous eater. I'll try most things twice (just in case it wasn't prepared well the first time around). And here I was standing in front of a fruit that some places in Southeast Asia won't even let you bring into the building. I didn't buy one. I walked away with the thought of this spiny green melon-like fruit still in my head. I must admit - I'm still tempted to go back to Fubonn and pick up one, bring it home and crack that bad boy open on my back porch. What did it taste like to you? Would you eat it again? I think it's awesome! It's really creamy and custardy. Kind of a cross between a banana and a coconut. Some people say that it also has a bit of an oniony taste, but I don't get that. I actually don't think it smells all that bad either. Like, I threw the rind of one away in the wastebasket in my house and nobody who came over told me my house stank, and my friends would tell me! Meh. Overrated. Wasn't worth the build up, either for flavor or smell. Doesn't do much for me but was the subject of a long dinner conversation a few nights ago so coincidence that you ask your question right now! Hm. I have to say that at this point I might be heading over to Fubonn this weekend to pick one up. I'll make my sister's bf try it with me (he'll eat anything). Haha. Nick likes it but isn't sure if I will. But he also wasn't able to think of a way to describe it to me. If I decide to I'll make sure to let you all know what I think. If you try it and don't like it, don't throw it away! You might like it in a cake. I made durian cake, which Tim loved, although he didn't like the taste of it raw. See I asked Nick how else I could eat it and he said just plain. I was thinking in a smoothie with bananas, yogurt, etc. The durian cake I made was basically like a pound cake. It was dense and kind of sticky but not overly sweet. My friend Kat @theengineersotherlife and I tried some on our trip to Thailand, and I can't honestly say I recommend it. We picked up a processed version of it that came in a plastic tube - much like cookie dough or Chub dog meat - on a trip to the local 7-11 equivalent in Phuket. It was on the list of random crap we wanted to try, along with shrimp Pringles and funny flavours of Coke and gum and these weird chips called Krong Krang which seemed to induce hysterical laughter. The durian we ate could best be described as rotting mango which has been vomited up and is sitting in a puddle of garbage in the gutter in a fresh produce market somewhere in a developing nation. I consider myself to be fairly open minded about food, but I am willing to concede that my pre-conceived ideas of what a fruit ought to taste like may have interfered. Of course, that may be a problem specific to the processed version. I have a Malaysian friend who is mad about the fresh stuff, so hopefully your experience is/was similar to his!!! 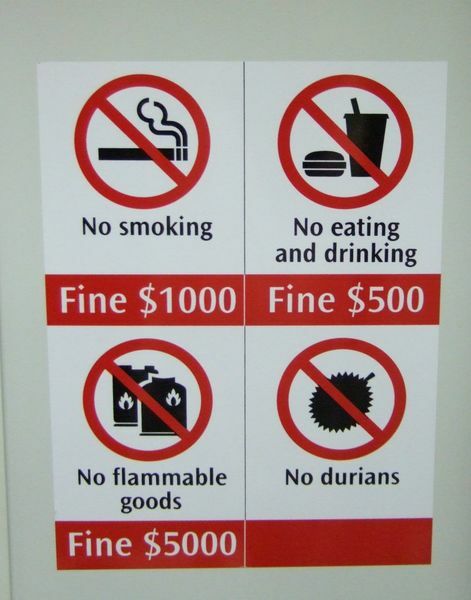 But then, I have to remind you, there's a wide variety of different kind of durian led to different kind of taste. So, dont really jump to the conclusion much quickly. There's one with tangy taste to it, one with a really sweet and custardy taste, and even in the same kind of durian it may taste differ, depending on the ripeness( i wasnt sure if i used this word right)of the durian. 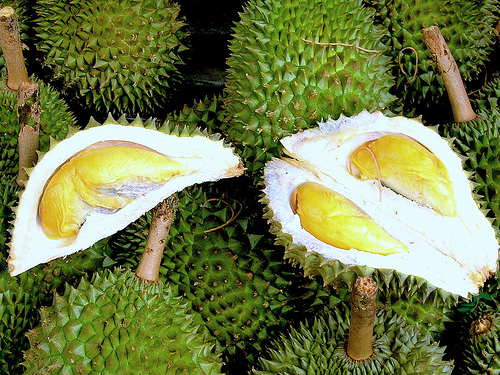 Seriously, when you find one perfect durian, it'll taste like heaven! Have a visit to Malaysia, and it's gonna be a pleasure to be ur private tour guide.